This entry was posted on October 17, 2015 by John Hartley. The perfect ride. It is the elusive nirvana that you seek every time you hop on your sled. Every snowmobiler has a short list of the best rides or trips of their lives and there is always a ride that ranks at the top of the list, a ride by which all others are judged. For me that ride came when I was fifteen years old. I have had great rides since then but there still hasn’t been one to knock that childhood memory off of its perch at the top of the list. My family purchased their first snowmobile when I was 3 years old and my first snowmobiling memory was riding with my parents down the power lines and winding up a Shakey’s Pizza. If there is anything that would guarantee someone becoming a snowmobile fan it is bringing a five year old kid on a snowmobile to a pizza place! The Shakey’s trip started my love affair with the snowmobile but the thing that truly cemented its place in my heart were the days riding with my neighborhood friends: Paul, Mike, Matt and Cy. Paul’s family owned several Ski-Doo Olympiques and it was the rides with my friends on those machines that ultimately led me to spending my entire summer of 1982 caddying at the local golf course and landing every babysitting job I could get my hands on to save up enough money by fall to buy my first snowmobile: a 1972 Ski-Doo Olympique. By the following winter Paul had gotten his driver’s license and bought a green Chevy Van. Now we could not only ride our sleds around the neighborhood but we could also trailer them to places more exotic. That December Paul invited me on a snowmobile trip to his family’s cabin which was on a private lake about an hour north of Duluth. Since we were on Christmas break Paul and I would drive up with our sleds Friday Morning and then Paul’s dad (Henry) and his dad’s friend (Michael) would come up with their sleds Friday night. Paul and I got up at the crack of dawn Friday morning and loaded up my Olympique and his older brothers’ new Yamaha Enticer. As we were about to pull out of the driveway Paul’s dad stopped us and asked us if we had the spare for the trailer. “You never leave without the spare,” his father said, and he demanded that we go up to the shed and fetch the spare. Begrudgingly Paul followed his dad’s orders all the while grumbling under his breath how over cautious and silly he was being. Of course half way to the cabin the trailer got a flat tire, proving once again why dads are smarter than know-it-all teenage boys. When we finally arrived at the road leading into Paul’s cabin I was shocked to see that the road had not been plowed and was covered with over a foot of fresh powder. “Don’t they plow the cabin road?” I asked. “What about all of our gear?” I asked. This was the coolest thing that I could even imagine- being forced to snowmobile into a remote cabin, but the best was yet to come. We unloaded the sleds and packed as much gear on them as we could and as we were about to head out Paul said to me, “You’re going to have to lead because the Enticer isn’t that great in deep snow.” This is where that defining moment happened that to this day makes this the single greatest snowmobiling ride of my life, breaking trail though a foot of fresh powder down a private road through a pine forest with the boughs of the trees laden with a thick coating of fresh snow. It was like something out of a dream. The Olympique churned through the deep powder sending an endless spray of fresh snow over the hood for miles on end. It just doesn’t get any better than that! When we reached the cabin and went in for a few minutes to start a fire and then dug out the dogsled and hooked it up to my snowmobile and forged our way back out to the road. We filled the dogsled with supplies and rode back to the cabin which was now toasty warm from the fire we started earlier. As typical teens we just carelessly tossed everything into the cabin so we could get back out on the sleds. This is where the second awesome part of our day began. We rode down to the lake to see that it had also remained untouched by any other snowmobile since the last snowfall. Paul and I looked at each other and even though our faces we covered by ski masks I could see in his eyes that he had a smile as big as mine. We hit the lake and spent the next several hours carving through foot deep powder until we had significantly crisscrossed the lake with about a hundred snowmobile tracks. The winter sun was starting to set so we decided to ride back to the cabin. When we arrived we were surprised to see Paul’s dad’s ’72 Olympique 335 parked outside next to Michael’s ’72 Ski-Doo T’NT 440. We went in and received a major tongue lashing for just throwing everything on the floor and taking off. This was still the time when you could get chewed out by your friend’s parents without having your own parents freaking out about it, and Paul’s dad let us both have it. After making us do some cleaning and firewood gathering for failing to properly put away put the supplies we all sat down to a fine dinner of steak and hash browns. This to me was a lot like the meals I had with my brother and father at the hunting shack, we always ate way better out with the men then we ever did at home. Then it was a night of cards until Paul and I went off to bed exhausted after a long day of carving through powder and digging out the Enticer. As I laid on the bunk staring at the ceiling I listened intently as Paul’s dad and Michael reminisced about snowmobiling trips of the past over a few cigars and a bottle of whiskey. The stories were heightened by Michael’s thick accent. I don’t know what country the accent was from, maybe Norway or Finland, but it was really cool and hearing them talk about their past journeys through the Minnesota wilderness on old Ski-Doos made me wonder if I would ever be able to pass on similar stories when I was their age. Ironically, not only did I get to do it but I got to keep their memories alive by relaying this story on a huge mass media forum. The second day we followed Paul’s dad and Michael across the lake to a private trail that hooked up with the Pequaywan Trail. Michael couldn’t resist cracking open the 440’s throttle and rocketing across the lake leaving us in his snow dust. 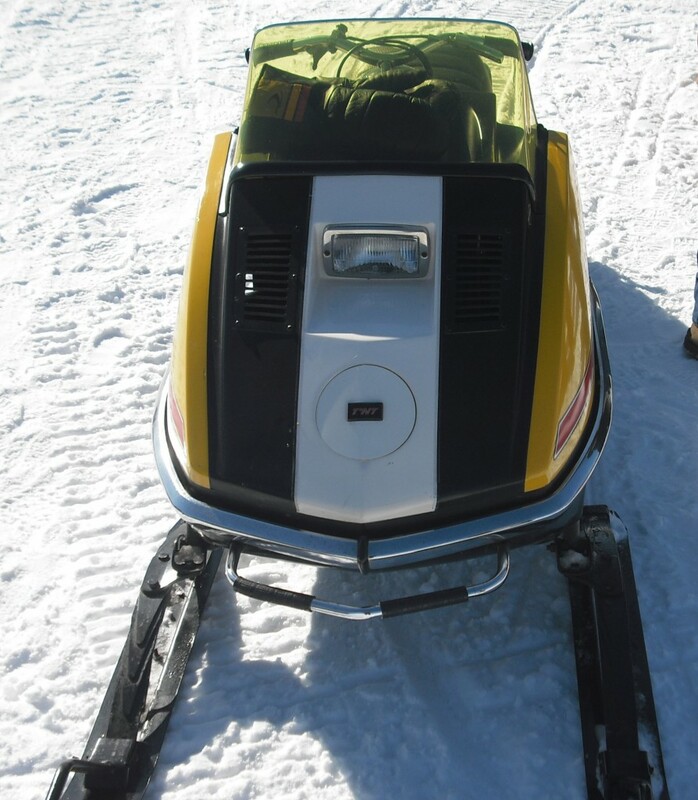 This started my love affair with the T’NT and I’ve wanted to land a ’72 T’NT ever since, but my wife isn’t too keen on adding another sled to our already crowded corral. The Pequaywan trail was the first time I had ever been on a state trail in my life which added to the overall awesomeness of this trip. Paul and I broke away from the pack as this was the type of riding the Enticer had been designed for. Even though my Olympique had dominated the Enticer in the deep powder I was no match for him on the trail and I struggled to keep up. Faster and faster Paul went as he became more comfortable with the Enticer’s handling, but his thirst for speed soon ended when we came to a bridge and the hump at the bridge approach launched the speedy Enticer into the air and made Paul jump a good portion of the bridge span. He came down hard on the other side of the creek and pulled to the side of the trail with his eyes as wide as saucers. “Did you see that!? I jumped like 15 feet!” he said half excited and half terrified. Paul’s dad and Michael caught up to us and pulled to the side of the trail. “You boys follow us,” Paul’s dad said. “We are going to be turning off of the trail soon.” Paul’s dad and Michael rode ahead of us at a much slower and more casual pace. The trail crossed a road and we left the trail to follow the ditch line for about a mile where we then turned off into the woods and followed a short trail to an old logging road. No one had been on the logging road which meant miles of untouched powder, unfortunately Paul’s dad and Michael got to lead the way and enjoy all of the trail breaking duties. The sun was beginning to set and the cold was creeping in on us as logging road conveniently duped us out close to the main road that lead back to the cabin. We once again got to ride through the majestic snow laden pines with our headlights cutting through the cold darkness. By the time we reached the cabin, the chill had cut through my gloves and boots and hunger was burning inside my stomach. We once again feasted on a huge outdoorsmen’s meal and warmed ourselves by the fireplace. After a long day of riding Paul and I retired early and I drifted off to the sounds of the two old men recapping more stories of past rides that had taken place before I was even born. This entry was posted on October 10, 2015 by John Hartley. ANNOUNCING THE SNOWMOBILETRAIL.COM YOU TUBE CHANNEL! This entry was posted on October 7, 2015 by John Hartley.